Gouda is one of my favourite cheeses so, while I am living in the Netherlands, I thought it would be nice to visit the town that provided its name. I did a little checking online and read about the weekly cheese market that’s held every Thursday morning from April 2nd through to August 27th. Yesterday was the 2oth and the weather was good, so I decided to visit the penultimate Gouda cheese market of the year. The Gouda cheese market takes place in the village square in front of the old Cheese weigh house (Goudse Waag). In the Middle Ages Gouda was the only city in the County of Holland that was authorised to operate a cheese market so farmers from all over the county had to bring their cheeses to the city and sell them on the market square. 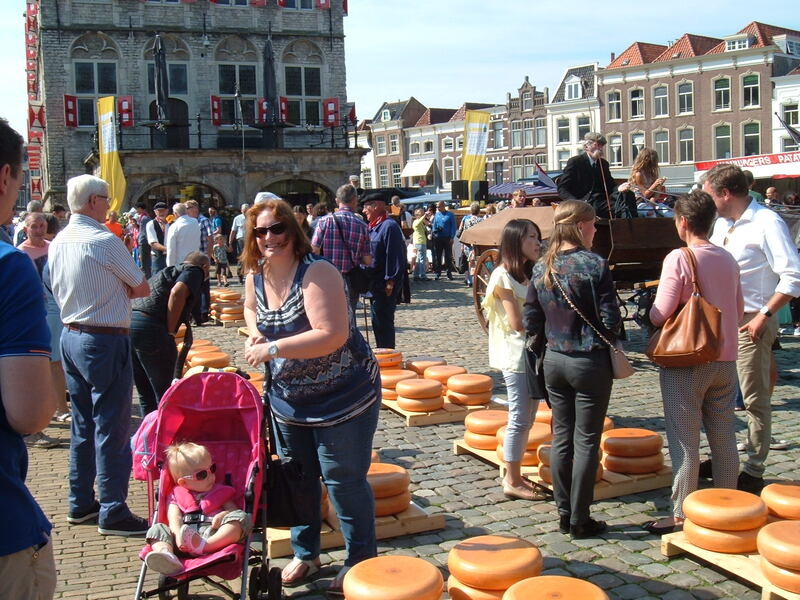 Buyers were given the opportunity to sample the cheeses before agreeing on a price and then, when the haggling was over, the cheeses were taken to the Goudse Waag to be weighed. These days the majority of Gouda cheese is produced in factories, but there are still a few hundred farmers who continue to produce cheeses on their farms and the necessary skills are often passed down from mother to daughter. Although the cheese market continues to take place and draw crowds of visitors from all over the world, the Goudse Waag is no longer required and, although much of the original equipment is still in situ, it is now home to the cheese museum. The bottom floor functions as gift shop. The second floor contains a number of exhibits and there is a guide available to provide any extra information visitors require. Craftsmen in the area used to produce candles and clay pipes, so the museum contains examples of both. The top floor of the museum contains further displays, and visitors who wish to know more about the cheese making process can take a seat and watch as short informative video. 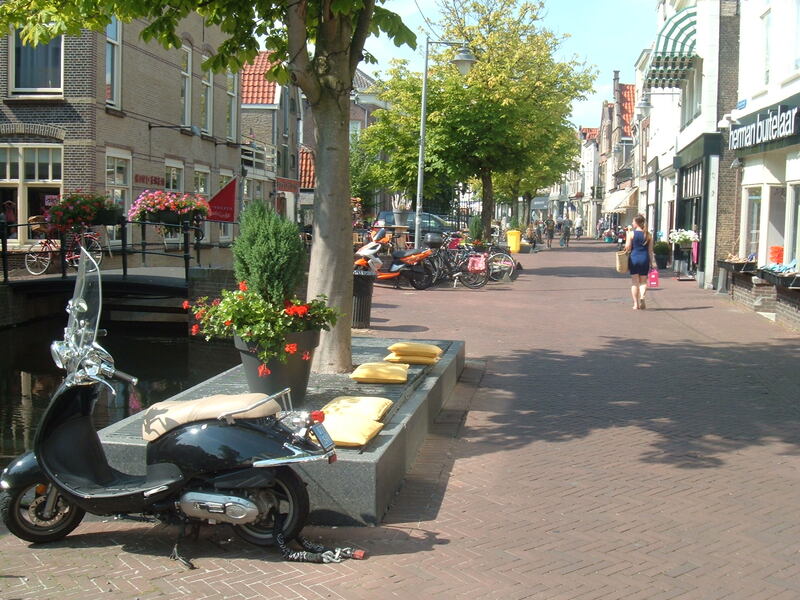 Yellow Cushions on the Streets of Gouda? Although it was very busy in and around the market square, I only needed to walk a few minutes to find much quieter streets, lovely canals and parks. I also noticed a lot of yellow cushions placed on walls etc., where people were likely to sit down. I popped in a bar and asked about this while I was enjoying a pint of Heineken. If I understand it correctly, the local council has made arrangements for the cushions to be put out each morning and then collected every evening. I don’t know if this situation is unique to Gouda, but I have not seen anything similar in any of the other Dutch cities I have visited, and I’m guessing the idea has to be scrapped in the winter. Fortunately the rain clouds stayed away during my visit so it was a good day all around.